I have to learn the right way to play tennis from an instructor. This therefore means that I am unwilling to experiment for myself for fear of starting bad stroking habits. This fear of being unable to change bad habits is another myth I will debunk in a future article. I have many students who come to me because they want to learn the right way to play tennis. There usually tends to be a serious flaw in that kind of thinking. For one thing there are many correct ways to hit a tennis ball. When I was growing up the prevailing school of thought was that you should always turn sideways (closed stance) to hit a forehand. That was the correct method to hit a tennis ball. So I did this for many years, without questioning it. I wouldn't even attempt to hit a forehand unless I had taken the sideways step. Do you know how many forehands I never even got to because I had to take those extra sideways steps? As it turns out it is not necessary to play tennis from a closed stance and that many of the best forehands in the world are open stance forehands. The open stance can give you more power and it certainly requires less footwork therefore making you faster. Personally, I use a modified open stance nowadays. The Williams sisters often hit open stance two-handed backhands. They have tremendous power on their backhands. What if some, "all-knowing," tennis pro told them that they shouldn't hit like that? Maybe they would never have gotten as good as they are now. Many tennis-stroking innovations and styles come from players trying new things. Think about what it must have been like to be the first tennis instructor. Someone had to be the first one. That means that person was totally self-taught. 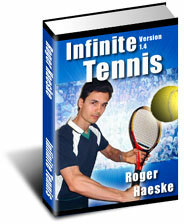 The first tennis instructor never knew the so-called right way to hit a tennis ball. He had to learn through experimentation and refinement of technique until he was playing great. But then he had to impart his experimental and experiential knowledge to someone else. So all the so-called correct tennis strokes were actually first created without tennis instruction. The point is that experience comes before technical knowledge. Mechanics are learned best through trial and error or experimentation. You must learn to trust your own judgment and not some concept of what you believe to be true. That concept may end up being incorrect and actually lead to worse strokes. You also have to adjust your technique to what is natural for you. My formula for the success of a tennis stroke is very simple. If the shot feels good to you and you can hit it consistently, with good placement, then it is a good stroke. This method requires no outside verification by a tennis pro or anyone else as to whether or not it is a good way to hit a tennis ball. This is a great way to learn because you won't have to struggle with unnecessary thinking of mechanics to hit good shots. Instead you go by feel and results. This is not to say that you shouldn’t take tennis lessons or learn about mechanics but it addresses more your attitude during a tennis lesson and during your practice sessions. The tennis pro can only guide you to finding your strokes. You the student have to be an active learner and not just absorb instructions blindly. There is a big difference in blindly following a tennis instructor’s outer verbal and visual commands and actually translating those instructions to your own inner understanding of how to hit the shot. I call this translation Inner Language. Any instruction from the pro whether it is verbal or visual is still outer instruction. It will be totally useless to you until you learn to translate it to your own kinesthetic (or feeling) understanding. I’ll give you an example from my life. I have a good friend of mine who is a great skier and was a ski instructor. We would go skiing and he would give me tips on how to improve my skiing. At first his tips did not work for me. My skiing actually got worse and I got very awkward and would fall down easily while trying the new technique. I did the technique exactly how he described it and it didn’t work. Then I decided to try and shift my mental focus inward and tried to feel the instruction. All of a sudden the technique worked great. I was now using my Inner Language and that was a totally different feeling. I was able to easily integrate the instruction with all the other factors necessary to ski. In effect I was now using my Inner Mechanics or the kinesthetic instruction from my subconscious mind. Now my awareness was complete instead of partial. I had a feeling of flow as opposed to frustration when I hadn’t yet realized how to translate the instruction to my Inner Language. Now as he started giving me more tips I learned to translate them to my Inner Language quicker and quicker. I believe that this is the major difference between fast learners in sports and slow learners. The slow learners are simply using the instructions literally and not translating them to their Inner Language. Learning how to do this translation is crucial but easy. The key is self-reliance as opposed to outer-reliance. You can accept outer instruction but them you must use experimentation, feeling and awareness to translate that instruction to your own experience of the instruction. The Inner Language uses a totally different part of the brain than the Outer Instruction. You must also have a specific goal of what you want your shot to do. In other words, pay attention to the results. Don’t just blindly follow an instruction if it’s not working for you. Also too much continuous outer instruction will get in the way of you making the translation to your Inner Language. Your outer conscious mind has a miniscule intelligence compared to the subconscious mind. It’s like comparing the tip of the Iceberg with what is underneath the surface of the water, in terms of intelligence. When you follow outer instructions only, you are only using your conscious mind which is like an absolute idiot compared to the intelligence of your subconscious mind. Your subconscious is the part of you that actually hits the shot and makes all the calculations necessary to get in the correct position and have proper balance, etc. The conscious mind can only think of one or two things at a time before it becomes totally confused while the subconscious is processing millions of bits of data to help you achieve the very complicated act of hitting a tennis ball. There is no comparison as to which intelligence is the strongest. What I have found is that the people who are natural athletes are the ones who can translate Outer Instructions to their own Inner Language the quickest. They trust their feelings. Learning tennis or any sport is mostly a kinesthetic process. You have to feel the stroke and not analyze it so much. Analysis often times leads to paralysis. Feeling, experimentation and awareness of what you are doing will lead to the best strokes. Too many players are overly worried if they are hitting the ball correctly. They want to conform to some kind of outer standard. Can't they figure out on their own whether or not they hit a good shot? I figured it out on my own. I was able to tell if my shot had enough power or consistency. I was figuring this stuff out when I first started playing tennis. All self-taught players go through this process of evaluating their own strokes. It’s the beginning and sometimes advanced lesson takers that haven’t yet learned to trust their own judgment. To be the best you can be you have to become your own tennis instructor. Remember; if the shot feels good to you and you can hit it consistently, with good placement, then it is a good stroke. You can always continue refining your technique with lessons, reading, experimentation etc. Just make sure you are translating what you learn to your Inner Language. I believe that tennis strokes are uncovered as opposed to being manufactured. You have to do a lot of trial and error. After all, you have to do the hitting. No one else can do it for you. Tennis strokes need to be discovered. They need to be realized. I have many students who come up to me able to repeat to me verbally what they should be doing but still can't seem to get themselves to actually do it physically. The verbal commands are only symbols of what should be done. The word is not the stroke itself. You have to take an instructor's commands and translate them into your own kinesthetic understanding. What I am trying to say is that the inner intelligence of the student is the supreme teacher and not the tennis instructor. The instructor should work with the student to guide the student to discovering his own strokes. Too much interference from an instructor can actually stop the student’s learning process. I have some students that only take tennis lessons and don't actually play tennis. I have found that they will learn better if I let them play and experiment with the ideas I have taught them. If they are constantly getting verbal instructions and not trying to find their own stroke they make no forward progress in their games even though they are taking many lessons. So what I have to do with these students is have days were I let them play against me with different focused exercises until they learn how to do the strokes on their own. I don’t give them very much instruction on those days.